Up, up, and away! Taking flight along the scenic coast of Palm Beach with one of the many parasailing excursions offered on the island is a must for adventure seekers. Parasailers board a speedboat that whisks them from the shores of Palm Beach out a few hundred yards where they are launched into the sky over the azure Caribbean Sea. The thrill starts as you lift up off the boat and into the air above Aruba's coast. Parasailers board a speedboat that whisks them from the shores of Palm Beach out a few hundred yards where they are launched into the sky over the azure Caribbean Sea. The thrill starts as you lift up off the boat and into the air above Aruba's coast. All fears quickly melt away as you glide confidently under a full chute when parasailing. Create your personal adventure and memorable experience while holidaying in Aruba. Nothing beats a birds'-eye view of the island while parasailing high up in the sky. From up on high, you can identify Aruba's most visible hilltop, the Hooiberg, the famous landmark of the California Lighthouse and the miles of white sand beaches of Palm Beach and Eagle Beach. 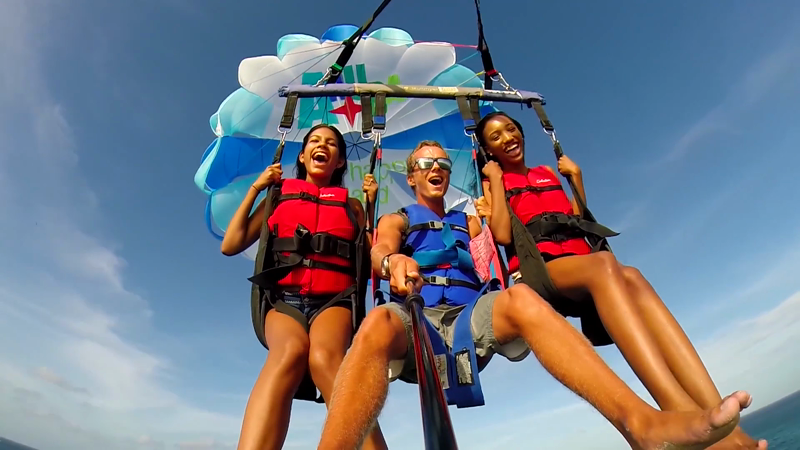 If you have yet to try parasailing in Aruba, you are missing out. Travellers from all over the world experience the best parasailing in the Caribbean here. Embark on your sky adventure at Palm Beach. Apart from the beautiful view of the Caribbean Sea and the coast of the One happy island, you will also enjoy the thrill of being high up in the sky with the salty ocean breeze in your hair. A thrilling ride you won’t forget in a hurry.